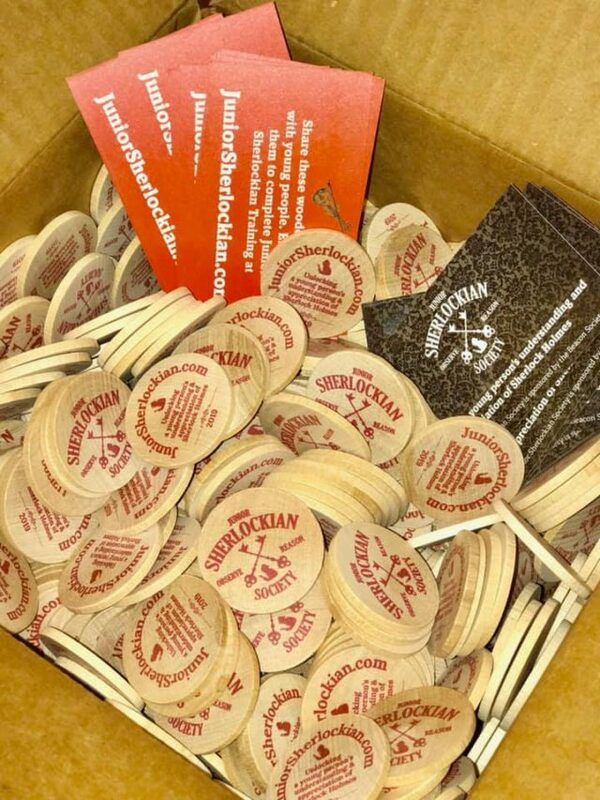 It wasn’t all that long ago that we wrote a post about the wooden nickels given out by the Junior Sherlockian Society at the 2018 BSI Annual Dinner. This January’s dinner featured another wooden nickel produced by the Junior Sherlockian Society. Sponsored by the Beacon Society, a scion of the Baker Street Irregulars, they are searching for children and youth eager to develop an understanding and appreciation of the great detective… Sherlock Holmes. The wooden nickel was distributed with the intent to increase awareness of the Junior Sherlockian Society and the efforts of the Beacon Society. As opposed to the previous wooden nickels, this year’s version has the 2019 date added and were printed in red ink. The 2018 woods were printed with black ink. Attendees at the BSI annual dinner and the Gaslight Gala received 2 nickels each along with the pictured card in a small mesh bag wrapped with ribbon. They seemed to be well receive by the attendees. Disclosure: Your Editor currently serves on both the Junior Sherlockian Society and Communications Committees for the Beacon Society.